"Amazing, Robert Siegel at first I thought arrogant but soon realized it was confidence. Right to the point super amazing attorney. He knew what he was after and didn't settle for less. This man gave me a life changing experience and re-newed my faith in humanity. The arbitrator personally walked out to where I was with my attorney, shook my hand and said in all the years he's been doing this he had never seen anything like it, his words were "its nothing short of a miracle " the miracle was sent to me in the form of this wonderful attorney. Thanks Robert for your faith in my truth and in your abilities. Mine and my sons life have been forever changed." -Nora D.
"I hired Cellino and Barnes after my auto accident. 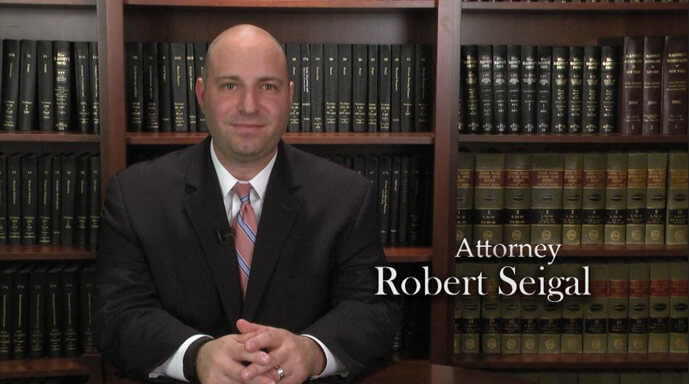 Rob Seigel was my attorney. I cannot speak highly enough about his professionalism in handling my case. He always answered my questions with in minutes. He definitely had my best interests at heart and got me every penny I was entitled to from the insurance company." -Ira B. The insurance companies employ a variety of tactics to keep you and your family from getting fair compensation. I know this because I used to work for those insurance companies, and I know how their legal teams operate. These insights have helped me become a successful personal injury attorney, and I’m proud to help injured clients get the best results possible. As an aggressive and experienced personal injury attorney, I know how to maximize my clients’ compensation. At Cellino & Barnes, we’ve gathered some of the finest attorneys in New York, and we work together as a team to achieve results our clients can be satisfied with. I’m no stranger to metro-area courtrooms, and I’ve prosecuted cases for clients in New Jersey, Long Island and all five boroughs of New York City. In addition to winning cases for my clients, I am also committed to keeping them informed throughout the legal process, so we can make the best decisions together.